Available in a virtual rainbow of colors, the versatile Snack Stack by Re-Play is the perfect snack container for school lunches, play dates, picnics on the beach and more. Made in the USA from recycled milk jugs, these stacking containers are lightweight, durable and BPA-free. Plus, these little snack containers tote just about any snack you need – from cut fruit to crackers to trail mix and much more. You can carry one single container or stack up as many as you need. All the containers nest and attach to each other for ease of carrying, and the chunky shape is perfect for little hands. Tops unscrew easily – even for younger kids, and all container components are dishwasher safe. So go green and save money on useless single-use containers and disposable plastic baggies by opting for the new Snack Stack. Available in a virtual rainbow of colors, the versatile Snack Stack by Re-Play�is the perfect snack container for school lunches, play dates, picnics on the beach and more. 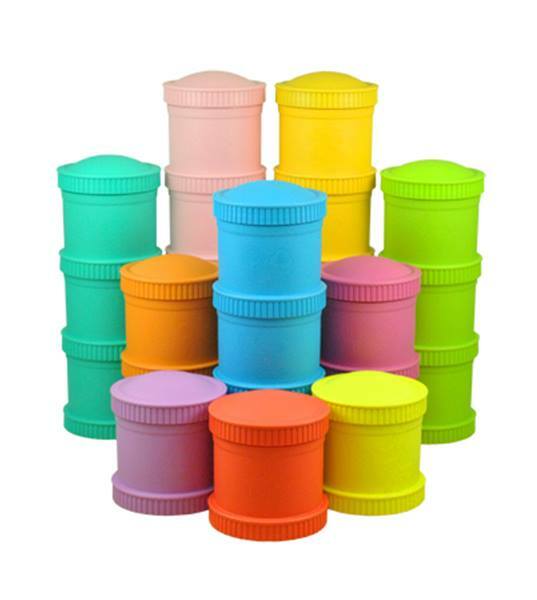 Made�in the USA from recycled milk jugs, these stacking containers are lightweight, durable and BPA-free. Plus, these little snack containers tote just about any snack you need - from cut fruit to crackers to trail mix and much more. You can carry one single container or stack up as many as you need. All the containers nest and attach to each other for ease of carrying, and the chunky shape is perfect for little hands. Tops unscrew easily - even for younger kids, and all container components are dishwasher safe. So go green and save money on useless single-use containers and disposable�plastic baggies by opting for the new Snack Stack.